“You are welcome”, or “You are family” were words we heard so often in Syria when we travelled with daughter-in-law Ghada on three visits to stay with her parents and family in Damascus. The house was designed around a fountain in the middle of what they called the “big hall”, though not very big by our standards. There was always a house full of people – sisters, brothers, aunts, uncles or cousins. As there was a mosque nearby, we would wake up in the mornings to the call to prayer and a muezzin reciting from the Quran. Lots of people would sit outside their homes of an evening, kids playing in the streets till late and men with their prayer beads in hand. The men greeting you with a double hug and a kiss – a bit different to the handshake we are used to. The family would always cross themselves when they walked out the door onto the street or into a car or taxi and when we passed a statue of the Virgin Mary, of which there were many around the city and in the country villages. Our first trip was in 2005, an experience I’ll never forget. The traffic on the road from the Damascus airport to the city was a mixture of lorries with all sorts of funny loads; motor bikes, some with mum and dad and a couple of kids on board; three -wheeled motor bikes loaded with goods; and horses and carts with wares to sell. I don’t remember seeing line markings on the road, but there was plenty of honking of horns and weaving in and out. We eventually reached a big roundabout to enter Bab Touma, a section of the old city. So many cars, lots of yellow taxis, lots of honking. Glad I wasn’t driving! Through the old city wall, we drove along ancient cobbled laneways, mostly one way and shared with pedestrians. Ghada’s parent’s place was down a narrow lane. There were lots of steps and buildings over hanging. We stopped to get our luggage out of the van, with every one behind honking their horns. But there was no sense of aggressive impatience. Just a message: ‘We are here. Don’t be too tardy’. My first experience of Damascus. Eating or feasting was a big part of family life and there didn’t seem to be a set time for any meal. Breakfast from mid-morning to midday, depending on who popped in and what was available or what the hawkers were selling cheaply. The hawkers called out their wares many times a day; it could be corn or water melon or another fruit or vegie in season; a milkman with two 20-litre cans of fresh milk strapped to his push bike and calling out hahlib harlib. We would eat anytime, mid-afternoon or evening, and I’d be thinking that might be all the eats for the day, but there could be another meal if someone was visiting or if we went out to visit another family. We could be eating until 10 or 11 o’clock at night! They would try and out cook each other trying to impress us and we would come away very full. They didn’t eat out at restaurants unless there was a really special occasion. Corn on the cob was cooked on little gas cookers and sold on the street corners. We quite liked the little pizzas or savoury pastries they baked in the little local shops. Cash was the way they did business and you’d see them counting their takings, and I remember at a petrol station the attendant filling the car and having a fistful of notes. The minibuses were interesting to travel in. You would hop on board and then somewhere along the journey money would start to change hands and eventually the driver would be paid. The taxis in 2005 could take as many as they liked with the grandkids standing up, but in 2009 everyone had a seat and everyone wore a seat belt. The bigger buses were decorated up to the hilt, chrome and lights all over. Some of the small Suzuki ½ ton Utes with their side mirrors all scratched from the narrow lanes also carried a fair bit of decoration too. Some of the horses pulling carts loaded with garlic, watermelons or diesel were done up in fancy harness and colourful feathers. Shopping was a bit different in Bab Touma and the souks (lots of small shops in alleys that didn’t allow cars). In the souq, it was all about haggling over the price and the little shops were stacked to the roof with merchandise and if they didn’t have the item they knew someone that did, probably a cousin or some other relative. We went into a shop looking for a tablecloth, explained what we wanted and the shopkeeper took us to back rooms loaded to the ceiling with stuff. One memory of Souk Al-Hamidiyah was of all the fancy lingerie, fancy stuff – so many different styles and colours – but the part that amused me was the women in black, and all you could see were a couple of eyes looking at this fancy underwear. Unreal. Another memory of the souk was buying ice-cream that was topped with pistachios or pine nuts. Ice-cream a bit different to ours, but nice on a hot day. Also I remember this chap with his dark Turkish cap and red and black striped clothes with a brass fountain on his back selling cups of some tamarin juice, or some other drink to refresh. 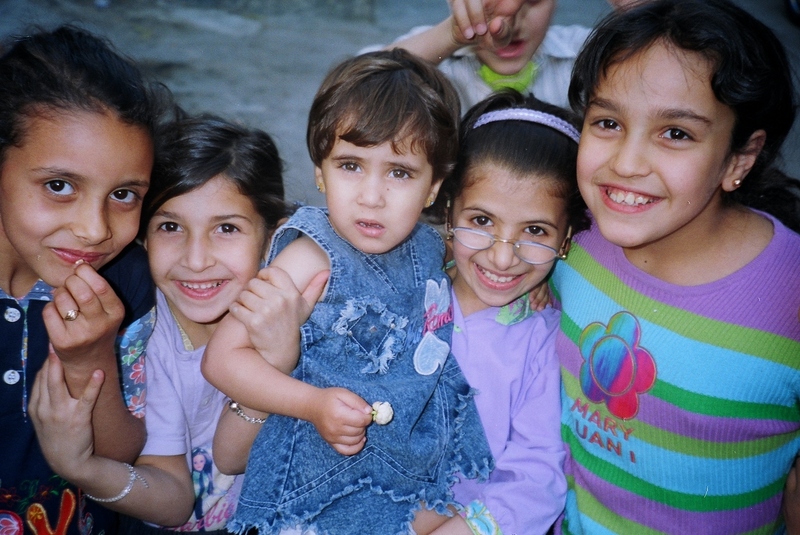 Australian students on a tour of Syria, Umayyad Mosque, Damascus, 2008. The Omayyad Mosque is a magnificent building in Damascus inside the walls of the old city. Before entering, we had to take off our shoes and the ladies had to put on a grey dustcoat and hoody if they weren’t dressed appropriately. I was wondering if our shoes would be there when we came out, but all was good. Not far from Damascus is the Convent of Our Lady of Saidnaya, built on a rocky hilltop with many churches, halls and prayer rooms filled with lots of old icons. Our family spent time with some of the nuns there. It has a good view of the surrounding countryside. On the stairs up to the convent was a stain that many think looks like the weeping Mother Mary, and people would stop for a prayer and reflection, and some would tie a tissue to the fence. Beyond Saidnaya, the first thing we noticed were the terraces of olive trees cut into the sides of the hills on pretty poor looking ground, probably hundreds of years of work. At Maaloula, we stopped to visit an ancient church where they recited the Lord’s Prayer in the language that Jesus spoke, Aramaic, and which local villagers, Muslims and Christians, still speak. From the church, we walked to the town down this high gorge, between two big waves of rock and on the way we saw the Remembrance poppy. Out of Homs, we visited a massive citadel on top of a hilltop. The Krak des Chevaliers dates back to around 1031. Amazing how it was constructed with large carved stones. Nearby was St George’s convent and church dating back to the 1st century AD, one of the oldest in the world. Lots of gold plated icons on the walls. We climbed on our hands and knees through a stone door to a sort of buried old church. We heard the old door going clunk when it was shut. 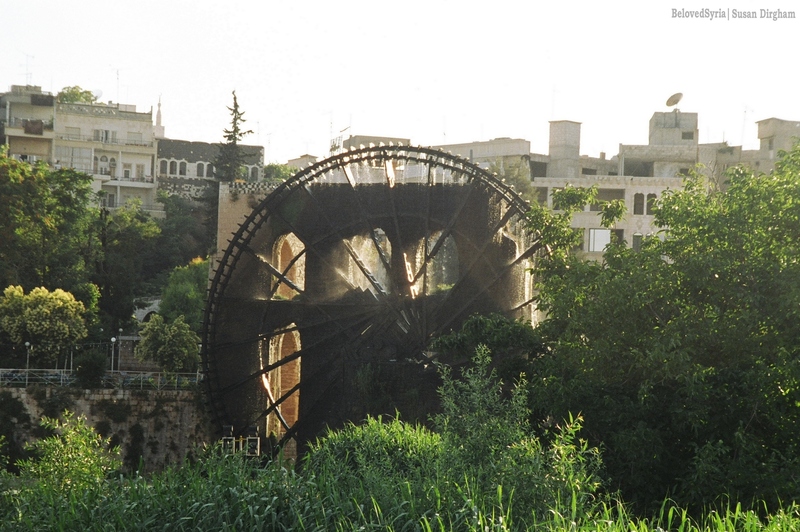 We drove on to Hama to see the big wooden water wheels squeaking away as they have done for hundreds of years, I guess. Once they used to lift water out of the Orontes River for irrigation. Wooden water wheels in Hama | by Chris H.
While there, we were bought a dessert to try that tasted a bit like ice cream and yogurt mixed together. Not for my taste buds!! Moving on, we came across a lady making flat unleavened bread in big stone ovens, very popular with the locals with us who enjoyed it without any spread or filling. The next stop was a resort town for lunch and a swim in the sea, the Mediterranean, I believe. And the beach? Black sand and very stony. We travelled to Latakia for the evening to a restaurant overlooking the white cliffs on the Mediterranean Sea. It was a beautiful sunset that evening and I still remember the fried fish we had. Some of the family were sucking or smoking the water pipes the waiters, mostly men, attended to. I tried a nargile, but I didn’t like it. Still, it was an evening I will never forget. Palmyra, Image taken from an old Syrian postcard. And to the east of the sea, in the desert, is Palmyra, an historical site about 250 km from Damascus with temples, amphitheatre and tall, tall columns. Some of the columns were carved from stone only found in Egypt, many hundreds of kilometres away. I had a camel ride there and saw a track where they race camels. The town of Palmyra had lots of palms but the surrounding area was treeless desert, as barren as you could get. In our travels, we saw sheep farmers, nomads who wandered around the desert country and followed the crops after they were harvested, their tents blowing in the desert winds. They looked to be just making an existence but some had a satellite dish near their tents. The small flocks were of mostly fat-tail sheep of many colours, sometimes with them was a boy, a donkey and a dog. Sheep farmers wandering around the Dead Cities, 2004. Image by Chris H.
We travelled to Aleppo by coach. It’s about a 300 km journey along a highway that had overhead lighting all the way. The desert country was very barren and then we came to farmlands. There are a lot of oil seeds grown in Syria. In Aleppo we stayed in this beautiful old hotel built around a fountain and a big courtyard with glass lifts to the second floor. Two tortoises were wandering around the tiled, marble floor. A terrific western breakfast was served there. Do hope it’s still in one piece. The Citadel in Aleppo seen from a nearby hotel, 2004. Image by Chris H.
The citadel of Aleppo is one of the best in the world, sitting on a hill in the old part of the town and we spent many hours exploring its palaces, mosque, baths and many other features from the 4th BC. 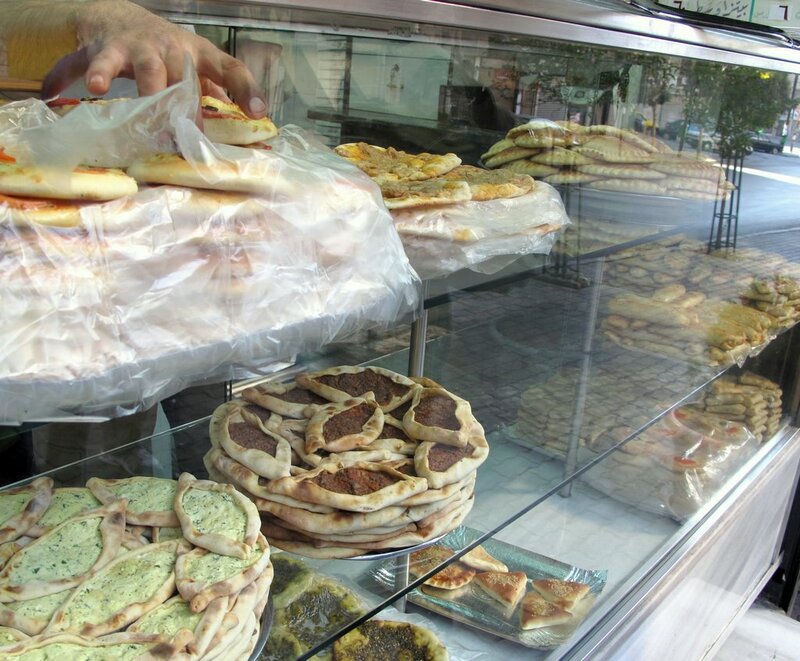 The Souks of Aleppo are the longest in the world, about 7 kms long selling everything imaginable. But what took my eye was the fat tail sheep hanging, its fatty tail about half the size of the carcass and every bit of offal for sale even the hooves. Some were buying bits of offal that were minced up and eaten raw in little eateries in the souk. I did eat some raw mince pinched up on some unleavened bread at Paradise, a restaurant near Saidnaya. 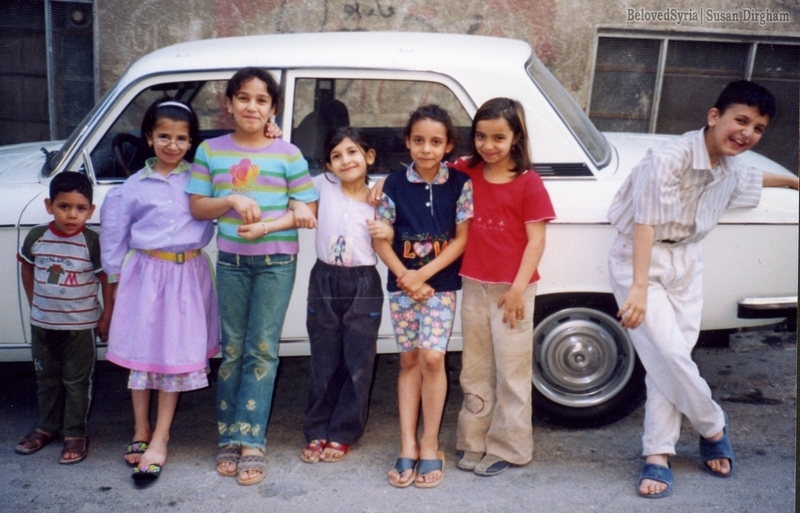 We came back to Damascus on the train, the Pullman they called it – about a 4-hour trip. The countryside seen from the train was a bit different to what we saw from the highway. Lots of stones and rocks have been picked up and put in rows about 100 to 150 metres apart to allow cultivation. We also saw orchards, mostly apricots and some very big silos to store the canola that was exported. Coming into Damascus after dark, the train driver was constantly on the horn as people, including kids, wandered along or beside the tracks. It was a good trip. We had seen a big statue of the Mother Mary somewhere in the country, and there were lots of statues of Mary in Damascus and many of the towns and cities around Syria. St Ananias Church or crypt is down some rocky stairs to two dungeon-like rooms with some icons on the walls. A statue of St Ananias baptizing St Paul is nearby. Baptism is a big event and quite a ceremony in the Greek Orthodox tradition, with priests chanting most of the service, immersing the child three times in a large font of water. The anointing with oil, the cutting of locks of hair, and family and friends parade around the font carrying candles. Later they celebrate at a restaurant for hours, a special cake, gold bracelets and chains given as presents and the ladies doing a sort of yodel or sound with their mouths. We noticed several times parades down the street. Sometimes it was a wedding party either before or after the event, yelling, loud music, heaps of flowers and the women making their special sounds. Once, we had a massage at one of the oldest baths in Damascus, the Hammam Al Malek, baths built around 985 AC. We were steamed, rubbed, oiled and massaged. When they started to massage us with what seemed like a kitchen scour, we wondered what had hit us. We were wrapped up in these big Egyptian silk towels and sipped black tea. It was mostly very hot when we were in Syria in July-August, with shops opening later in the morning and trading late into the evening, and families out on the streets. I loved wandering early in the morning up the many narrow laneways barely wide enough for one person. I walked freely and felt perfectly safe.